The blue-green hue of a Noble fir stands out among the surrounding Douglas fir trees. There is nothing like the smell of a fresh-cut Christmas tree to bring the holidays to life. For most families, the act of picking out the tree kicks-off the holiday season. We are so fortunate here in Thurston County as we have several amazing family-run Christmas tree farms to choose from. If you normally have an artificial tree, visiting a tree farm is still a lot of fun. Many sell handmade wreaths and other decor to spruce up your home or as great hostess gifts. Not to mention the fun to be had with a horse-drawn wagon ride, free hot chocolate, and visits with Santa that some of these farms provide. Reopening this year after begin closed in 2017, the Ames Christmas Tree will be opening the day after Thanksgiving. All trees will be $35. Beaver Creek Christmas Tree Farm has both u-cut and they-cut options on their cultured noble fir trees. Shop their custom wreaths, log candle holders, walking sticks, and other unique gifts. 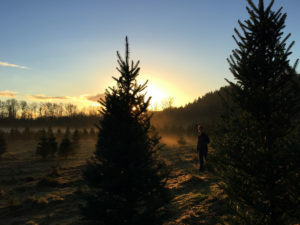 Throughout Thurston County, a handful of Christmas Tree Farms each offer unique and fun holiday experiences. Open daily beginning Thanksgiving week, 10:00 a.m. – 6:00 p.m.
Black Lake Trees has a variety for you to choose from in both u-cut and they-cut, including douglas fir, fraser fir, grand fir, noble fir, Norway spruce, and more. The farm is a wonderful wooded wonderland that makes for a wonderful family experience. Tree netting is available to make transport easy and they offer free greens for your mantle. The Cetak Family Christmas Tree Farm is closed this year. 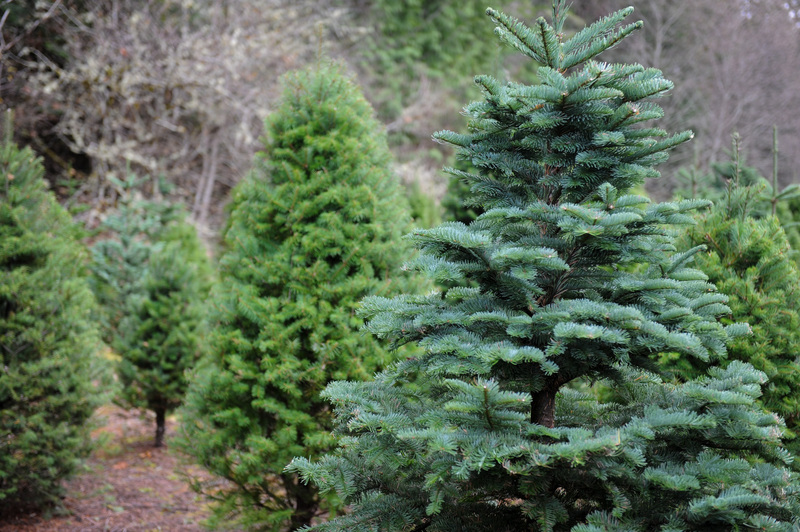 Open November 22 – December 24, 9:00 a.m. – 5:00 p.m.
Christmas Valley Tree Farm has a large selection of trees including nobles, douglas firs, grand fir, blue spruce, nordman fir, and more. They also offer wreaths and holly to help deck your halls. Open November 23 – December 16, Friday-Sunday: 9:00 a.m. – 5:00 p.m.
Clyde ‘n Dale’s Holiday Trees & Gifts is a must-stop for everyone, whether you need a tree or not. They have a team of horses that will take you via trolley to your tree. Choose from noble, fraser, grand and douglas. The gift shop carries local crafts and ornaments and they have music shows and entertainment for kids of all ages to enjoy. Don’t miss Santa and fresh hot cider. They have some special events happening including Off Boulevard singing carols November 24 from 12:00 p.m. – 1:00 p.m.; Pony rides on December 1 from 10:00 a.m. – 3:00 p.m.; and Kennon Mauer performing December 8, 1:00 p.m. – 2:00 p.m. NOTE: Tree sales stop December 9, gift shop open until December 16. 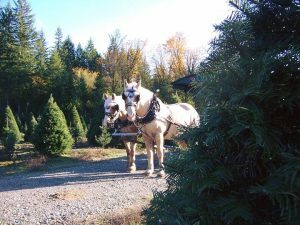 Bob and Dutch will transport you in style through the acres of trees at Clyde ‘n Dales Tree Farm. Photo courtesy: Clyde ‘n Dales Tree Farm. Hicks Christmas Trees carries nordman fir, douglas fir, grand fir, noble fir and canaan fir. They have both u-cut and pre-cut trees for you to choose from. They also offer flocking, stands and other tree supplies. Check with the farm for weekend closing times. 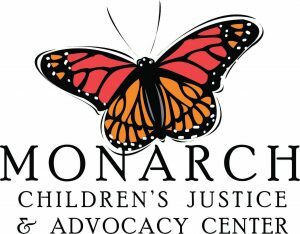 Open November 23 – December 23, Monday – Friday: 10:00 a.m. – 6:00 p.m., Saturday – Sunday: 9:00 a.m. – 6:00 p.m. The Hunter Family Farm goes from pumpkins to Christmas trees in the blink of an eye. They go all-out for each holiday, and Christmas is no exception. Pick out your tree, of course, but give yourself extra time to see the live reindeer, visit Santa, take a winter wagon ride or a pony ride, and shop their Christmas shop, including decorations such as garlands, boughs, and mistletoe and gifts. 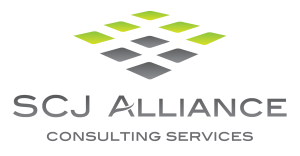 Don’t forget the free hot chocolate and coffee, that pairs perfectly with the treats at the concession stand. It’s truly a magical place, they have even had engagements happen. Maytown U-Cut Christmas Trees is a u-cut Christmas tree farm. They also offer wreathes and boughs for decorating. Saws are provided, or bring your own. 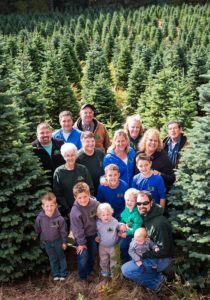 The Schilter Family Farm has noble, fraser, grand and douglas firs that are all u-cut. They also have a selection of fresh-cut trees each day for those who prefer to not cut themselves. A festival hayride will take you and your tree to and from the forest. They also offer flocking and can drill your tree to fit in one of their specialty tree stands. Afterwards, shop their fresh-cut decor items including garlands, wreaths, kissing balls and centerpieces, as well as holiday gifts. The first three Saturdays of the season have Santa visits from 12:30 p.m. – 3:30 p.m. They also have a lighted nativity scene in their barn. Sprouffske Tree Farm in Rainier has noble, grand and douglas firs for you to choose from. Trees are sold by type, not by foot, so go ahead and get that 10-footer! They also offer fresh wreaths, sways, arches, door hangers, tree stands and bows. You can even order a horse-shaped wreath for the equestrian in your life. If you are looking for a true woods experience like in National Lampoon’s Christmas Vacation, then you will want to look into cutting a tree in one of our local National Forests. For just $5, you can get a Christmas Tree Permit. These permits go on sale in November. Fourth graders can receive a free permit. For more information visit the National Forest website.